Here are the basic steps to cleaning your hearing aids. Your audiologist and healthcare professionals should be cleaning your hearing aids every time you visit, but if you want to clean them at home you certainly can. Your hearing aids are sensitive pieces of equipment that you don’t want to be damaged, so proper maintenance is important. Keeping everything related to your ear health clean and functioning is incredibly important, so be sure to follow these tips for keeping your hearing aids clean. First, you’ll need the right tools for the job. This includes a specialized wax pick and brush for getting earwax out of the microphone or receiver. You’ll want to establish a routine so you get used to cleaning it out every day at the end of the day. Be careful about getting water onto your hearing aids, you don’t want to damage them. Don’t use chemicals or alcohols that could be damaging either. 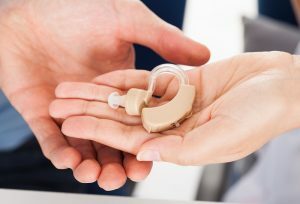 You can use a soft-bristle toothbrush or one of the mentioned hearing aid cleaning tools to clean out the holes and microphones on the hearing aid. Angle your tools downward so debris doesn’t fall back into the holes, then clear out the inner holes. Once you’re done, wipe down the whole hearing aid with a clean, dry cloth. There are custom tools you can buy from over-the-counter shops for this, but it’s pretty easy. You’ll want to use a wax pick to get rid of any earwax or debris that’s anywhere on the device. Afterward, remove the hook from the earmold and use soapy water to clean it thoroughly. Force the water out from the tube with a blow dryer and leave it somewhere safe to let it dry. Bay Area Audiology can help your hearing recover! This entry was posted on Friday, May 26th, 2017 at 9:09 am. Both comments and pings are currently closed.